Rosie the Riveter, a Norman Rockwell painting, appeared on the cover of The Saturday Evening Post published May 29, 1943. This painting is another reason that Rockwell is a favorite of collectors and critics today. Rosie graced the cover of the Post for its Memorial Day issue in 1943. This painting was Rockwell's second cover for The Post in 1943. In 1943, there were five Norman Rockwell Saturday Evening Post covers published. This was also Rockwell's 214th cover illustration out of 322 Rockwell painted for the Post. Rockwell's career with the Post spanned 47 years, from his first cover illustration, Boy With Baby Carriage in 1916 to his last, Portrait of John F. Kennedy, in 1963. The original oil on canvas painting, 52 x 40 inches or 132 x 101.5 cm, is currently part of the collection of the Crystal Bridges Museum of American Art in Bentonville, Arkansas. Framed dimensions of the painting are 62 inches high x 50 inches wide x 3 1/4 inches thick. and on page 153 of Norman Rockwell, A Definitive Catalogue by Laurie Norton Moffatt. Rosie was also published in the July 1, 1943 issue of The Art Digest. I have seen pristine original copies of this magazine cover sell for big bucks on auction sites, sometimes huge amounts. Think about it: it only cost ten cents at the news stand. Of course, it was mint condition then, too. This classic Norman Rockwell painting shows a muscular young woman doing her part for the war effort during World War Two. The name "Rosie the Riveter" appears to have appeared in a song before it appeared in print or paint. In 1942, Red Evans and John Jacob Loeb wrote a song with that title. It was issued by Paramount Music Corporation in early 1943. The song received radio airplay across the nation. The most popular version was recorded and released bt The Four Vagabonds, an African-American singing group. Their version of the song became popular and appeared on Hit Parade. Rockwell probably drew from that song for his inspiration for this iconic visual rendition of an American hero. Norman Rockwell's Rosie is pictured enjoying her lunch break. In fact, we know her name is Rosie because we can see it written on her lunch box. She looks almost regal in her pose. This Rosie the Riveter video plays the song with the lyrics captioned at the bottom. It also features vintage footage of real-life Rosies at work. Enjoy. None of the Post's readers would forget exactly why Rosie is at work with her riveting gun, building ships and planes, tanks and armored personell carriers, landing craft and even bombs. But, just in case, Rockwell has included a subtle reminder at the bottom of his canvas. Rosie has a copy of Mein Kamph, Adolph Hitler's autobiography, under her pink bobby-sock and penny-loafer clad feet. The model Rockwell used for Rosie was Mary Doyle, later Mary Keefe, then a nineteen year old telephone operator from Arlington, Vermont. Mary posessed a slim physique, unlike Rosie. Young Mary was quite shocked to see her head and face on a body with a physique totally foreign to her. Rockwell later apologized to Mary for the liberties he took with Rosie's physique to make her seem more apt to be wielding that rivet gun. The pose Rosie assumes is said to emulate Michangelo's painting of the prophet Isaiah from the ceiling frescos of the Sistine Chapel in Vatican City in Italy. In fact, shortly after the Post first published Rosie, one of the nation's newspapers, the Kansas City Star, published a side by side comparison of the classic painting and Rockwell's Rosie. Buy From Art.com See the resemblance? In addition to the Biblical pose, as a further nod toward the rightness of Rosie's cause, Rockwell has further embellished her portrait with just a touch of a halo. You can see it just above and behind the upturned face shield visor she wears to protect her face and eyes while welding. Rockwell's version of Rosie is not the most widely published of the various Rosie renditions that appeared in the 1940's during World War 2. The most popular and widely reproduced Rosie is a poster issued by Westinghouse. That poster was painted by J. Howard Miller. One reason it is more widely published would be that copyright restrictions have been removed from its distrubition. The caption from that poster was "We Can Do It!" Unlike Rockwell's version of Rosie, Miller's version of Rosie enjoys no copyright restrictions and can be republished and even sold by anyone. For that reason, Miller's version of Rosie has appeared on everything from coffee mugs to lighters to cigarette cases to t-shirts to mousepads to US postage stamps. The copyright and licensing for Norman Rockwell's Rosie the Riveter is held by Curtis Publishing, the publishers of The Saturday Evening Post at the time of the painting's appearance on the cover. Norman Rockwell's Rosie the Riveter, with the background of the American flag, has come to symbolize more than it was originally intended. The painting and the popular song which inspired the painting and others were a homage to all the women of America. During the Second World War, most, if not all, of the able-bodied men were off in Europe or the Pacific, fighting the enemy. Women who had been "only" secretaries, housewives and mothers before the war were pressed into service on the home front. These women, these "Rosies," were suddenly pressed into service. Without the woman workforce, the men fighting the battles of the war would have run out of not only ammmunition, uniforms, boots and guns, they would also have run out of such dire essentials as food. Industry and the war effort would have practically ceased functioning without the Rosies of America. Rockwell's Rosie would have been more widely distributed, but the Post was apparently concerned with violating the copyright held by the song writers. A poster with the caption "Rosie the Riveter" was widely distributed to news dealers in 1943 heralding the painting's pending publication. No doubt, fearing a lawsuit over the use of the phrase, Curtis Publishing withdrew all of the posters. A signed affadavit, stating that the poster had been destroyed, was required from all the distributors. No known original copies of this poster are known to exist today. What a unique collectible that would be! The provenance of the original Rosie the Riveter Norman Rockwell painting is fairly complex. Here are the known times and places where she has resided. In 1943, Rosie was donated to the U.S. Treasury Department's War Loan Drive. She was sent out on a public tour to several of the larger cities. During the early 1940's, the painting went on tour as part of traveling exhibit. Many other works of art were included in the exhibit. Those exhibitions often included a raffle for one of the art pieces on display. One of the raffles, believed to have occured while the painting was displayed in Philadelphia at the Strawbridge & Clothier store, gave away Rockwell's original Rosie the Riveter painting. The lucky ticket holder was Mrs. P.R. Eichenberg of Mount Lebanon, Pennsylvania. The next known location of Rosie was a window display for the Chicago Pneumatic Tool Co. The window display, on E. 44th St in New York City, featured riveting hammers identical to the one painted in the picture, as well as a sign explaining the painting's history. In 2000, the original painting was sold to an anonymous collector, reportedly Salem B. Lewis, for 2 million dollars. From November 1999 until February 2002, Rosie was on display as part of an all Norman Rockwell exhibition. Entitled "Norman Rockwell: Pictures for the American People" the exhibit was a very good reason to visit the Simon R. Guggenheim Museum in New York. Rosie was even featured on the back cover of the exhibit's brochure. Where Is Norman Rockwell's Rosie the Riveter Now? In 2002, that anonymous collector decided to sell the painting. On May 22, 2002, the painting sold at auction by Sotheby's for $4,959,500. The bidding progressed from its opening at $1,500,000 and increased in $100,000 increments. There were four serious bidders that day, three on the telephone and one, Judy Goffman, now Judy Cutlet, one of the founders of the National Museum of American Illustration in Newport, Rhode Island. The winning bidders that day were a young couple, Kelly Elliott, owner of Elliott Yeary Gallery in Aspen, Colorado, and her husband, Jason Elliott, a partner in Ranger Endowments Management, a Dallas, Texas investment firm. The Gallery bought the painting on behalf of the investment firm. Rosie, it turns out, is Mr Elliott's "favorite representation of America." In a interview for the New York Times, he explained that Rosie the Riveter by Norman Rockwell was the first piece of art he had ever appreciated, way back in grade school. Rosie the Riveter was exhibited for a time at the Elliott Yeary Gallery. Rosie The Riveter was only one of 322 Norman Rockwell Saturday Evening Post covers; Here is the list of Norman Rockwell Saturday Evening Post cover illustrations. More recently, the painting has been purchased by Crystal Bridges Museum of American Art in Bentonville, Arkansas. The amount paid for the painting has not been disclosed. Some members of the Walton family of Wal-mart fame are reportedly major benefactors of the museum. I'm just glad to know that Rosie is owned by an institution that intends to let the public (namely, me) enjoy one of Rockwell's most famous and treasured paintings. 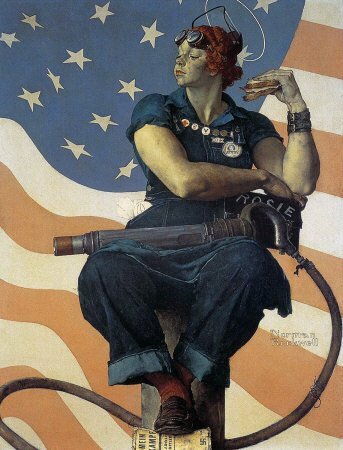 Rockwell painted another version of Rosie in 1943, Liberty Girl, also called Rosie to the Rescue. Do You Have A Great Story, Opinion Or Contribution About Rosie the Riveter?